1) When I finally got around to going to Mo’s, the prices were reduced dramatically. Modell’s over-order? Perhaps they need the space for Linsanity merchandise (still full-priced)? Whatever, I got my bargains. I love my Giants Super Bowl shirts and am wearing one proudly right now. But I’d rather be able to buy a “Champions” shirt that says Mets…and I’m not looking for another throwback model. As it happened, I plucked out of my drawer over the weekend one of my 2006 N.L. East Champion shirts, the only one that remains in rotation. It still fits and the Mets are still 2006 N.L. East Champions, so despite some misgivings about it having become an unintentional throwback, I keep it among the active and put it on a few times a year. It’s less and less current and taunts me a little more with every wearing, but I can’t consign it to the shelf of history. Even if it’s a reminder of the 2006 followup shirts that were never commercially distributed. Even if it almost inexplicably lists Dave Williams on the back. Now the Mets have one new shirt apiece. You may have read or heard the Mets COO, in a motivational moment, gave every one of his athlete-employees a tee with a “U” on the front. No, not to indicate the shirt is pareve, but to invoke Underdog. The sentiment is supposed to be the Mets are underdogs, like that eminently rootable cartoon pup from the 1960s who only appears to be humble and lovable Shoeshine Boy, but in reality is a superhero bent on saving Sweet Polly Purebred from Riff Raff and Simon Bar Sinister and whatever vile villainy they prepare to pull. I found Underdog quite the hoot when I was five or six. The Simpsons got a big laugh out of how ancient and obscure the character and the series were in 1990. It wasn’t that the villains doubted Underdog’s ability to fight them when he showed up with his speed of lightning and roar of thunder (both of which the Mets lineup could use). When Underdog appeared, it was more or less all over for his rivals. The Mets, on the other hand/paw, won’t step into a phone booth and put on their superhero costumes. They’re not humble and lovable Shoeshine Boys, no matter how affable and disregarded they may be. They’re the Mets. They’re underdogs because they’re undermanned. Which makes J. Wilpon’s message what exactly? That everybody doubts them? That nobody knows their true identity? That if we can just channel that doubt into can-do spirit, boy won’t those bastards from Philadelphia to Miami be surprised? Knute Rockne can rest easy. His motivational mantle is not about to be usurped. Every Met got one. Then, to raise the stakes, Stearns, who did not take losing well, made a revision. He taped over “CAN” and replaced it with “WILL”. The 1979 Mets, as always seems to be the upshot of these recollections, didn’t win much. But for the few days “WE CAN WIN” and “WE WILL WIN” made the papers, gosh, what a boost to the morale of the fan base. It was thrilling knowing one of our own took it upon himself to personally attempt to raise the sights of everybody in his clubhouse (oh how the newly acquired Richie Hebner must have rolled his eyes into a migraine that first week). Jeff’s shirt seems more like the wearable equivalent of the morale-boosting memo everybody in the office is supposed to pin prominently in his or her cube. It’s inane, but it’s the boss’s…or boss’s heir’s prerogative to do inane things. If it weren’t for saturation coverage of Spring Training and instantly transmitted backlash to anything Wilponian — much of the backlash richly deserved — these shirts would probably meet the same fate another set of shirts once met in a Met clubhouse. It was the end of 1998 and Turk Wendell helped himself to a stack of tees the Mets wouldn’t be using. They declared the Mets the Wild Card winner in the National League. Don’t look for confirmation on the left field wall should you dynamically price yourself into Citi Field this season. The Mets lost their last five games and blew the playoff spot the shirts were meant to celebrate. Nobody was going to be spraying champagne on these babies. Nobody was going anywhere with them, save for Turk, who must have figured a shirt is a shirt. Reminds me a bit of M. Donald Grant’s motivational speech to the 73 Mets. With a touch of Rachel “You Guys Stink!” Phelps from Major League. Are we sure that isn’t for Parve? Maybe Jeffy is cutting out meat at the post-game spread as a cost-saving measure…. I weep for Shawn Green’s favorite clubhouse snack. That was the matzah ball soup, wasn’t it? That book was worth it for the cheesy pix alone! Obviously it was meant in good fun to show the owner’s support of his players but after all Jeff has done to put the team in such an embarrassing position in the first place, coming from him it doesn’t seem so funny at all. It would have been more appropriate to have given them boxes of chocolates instead. Reminded me of a stunt the Orioles pulled on Thurman Munson back in 1970 when the Yankees were making a surprise challenge on them for first place in July. After losing the first of a three game series Thuman said the birds weren’t supermen. The next day Paul Blair and a few others walked up to him at the batting cage, opened up their jerseys to reveal a big “S” underneath them. Like David Wright (who didn’t have kind words to say about the underdog shirt) I didn’t appear Thurm thought that was so funny, either. 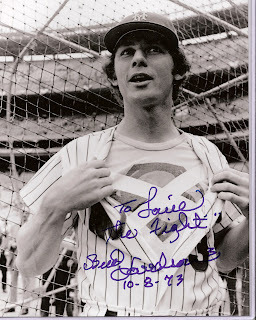 That reminds me of the day after the Pete Rose fight…Bud Harrelson opened his jersey to show a bandaged Superman insignia. If I recall, Underdog used to take a “Super Energy Pill” to defeat the villians…and that pill is now banned under the MLB Joint Drug Prevention and Treatment Program. Apparently (according to the vast research I did for this piece), the “pill” was referred to as a “vitamin” in recut versions so as to steer kids away from the glamour of a “pill”. Hope young Ryan Braun was paying attention. And remember kids, always eat your spinach so yuse can grows up to be big and strong like your uncle Popeye. Not mentioned was the fact that Mets players were each charged $21 per shirt. With all the minor leaguers and non-roster invitees in camp, Jeff cleared a cool $800. So smugly mock now if you must, but when we’re “buyers” around the trade deadline, remember Jeff and his outside-the-box initiative in spring training. Ungrateful bastards. So once again, young Jeffy shows how hip, chic, cool, and totally with it he is. How he really has the pulse of his team, baby! He’s like the rich nerd in fifth grade who owns all the balls and bats, and so gets to make all the rules, and all the other kids need to be nice to him, or they won’t get to play. Only in this case, fifth grade lasts a lifetime. It’s gonna be a long season. You bascically nailed it…but hopefully it won’t last a lifetime. Oh how I hope it won’t. you’re that hot for the dolans? Actually, between the Linsanity on the Knicks, and the coronation of King Henryk of the Rangers, the Dolans are doing a heck of a lot better than the Wilpons right about now. Which is not to say that I want them anywhere near my Amazin’s. But I’m just saying. This is all a horrible misunderstanding as Jeff Wilpon was originally going to print an ‘M’ on each shirts (for Mets) but found out that the ‘U’ shirts were being discontinued and were on clearance. Seriously, though, I remember a skit on SNL many, many years ago with Tom Hanks (I think) where he’s the new guy at the office and he sees how everyone is sarcastic to one another and when he tries to join in he just completely misses the mark as he can’t distinguish saracasm from outright cruelty. Some people just don’t have the ability to share a humorous moment with the guys and Jeff Wilpon is very much one of those people. From the beginning, Mets fans developed an ironic sensibility, a wry outlook and sense of humor about the club. It was organic. Lately, with wacky GM Tweets and “funny” shirts, management is forcing the issue. And typical of corporate management, when they insert themselves into something like this, it’s done poorly and reeks of insincerity. “Hey, we’re in on the joke! Ha ha! We’re not very good! Ho ho!”. It’s the difference between the spontaneous “Jose’! Jose’ Jose’ Jose’ Jose'” song in 2006, and when they started blaring a canned version of it over the Shea loudspeakers in 2007. Jeffy Boy probably hopes that this “U” shirt becomes all the rage, and some vendor (UPS?) will sponsor the orange “U” shirt giveaway night, filling the ballpark with you, me and every other Met fan he’s woefully underestimated. Can the fan-created orange “L” shirt, with Jeffy’s picture on it, be far behind? I’d buy one! Hopefully the 7 Line is working on one now. I’ll bet they are! Too funny…. …or a replica of the U shirt with an F inserted in front of the U. Anyway, I’m ready and rested for a brand new season. Nothing can stop us. Not bird,nor plane, nor even a frog. LGM.